Hand carved of solid curly, tiger and "birdseye" maple about 1840, this sweet "fiddle back" desk or side chair has a very fine finish. Restored and reglued to serve another generation, this American made New England antique furniture is strong and durable with various repairs over the years. The hand woven cane seat is new, the "bustle bar" front spindle is original, to accommodate hoop skirts. Measurements are 18" wide, 20" deep, 33 1/2" tall, the seat is 17" high and 16" deep. 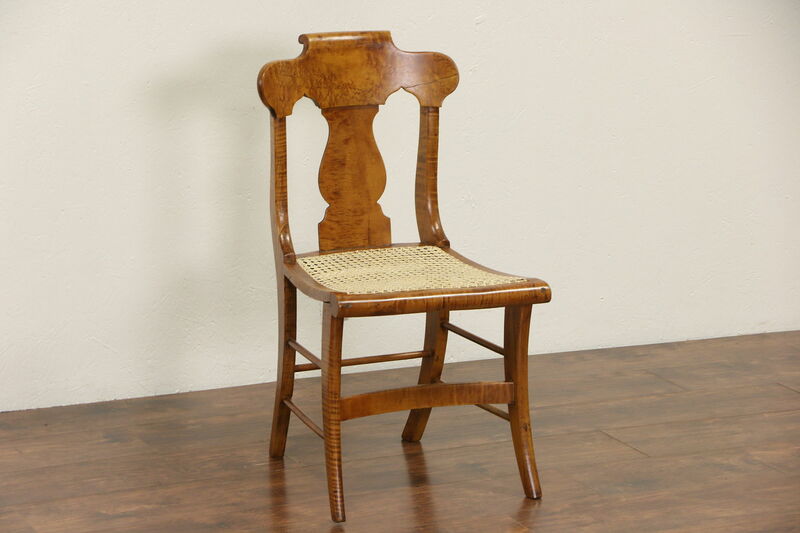 A similar chair is priced separately, call or email for availability.